Last week when we announced the two lucky winners of our Black Friday Giveaway, many of you were curious to see how their prizes turned out. We aim to please. The winners had their choice of a number of GLOGIRLY DESIGN prizes – Everything from blog headers to social media buttons to Facebook profiles and custom holiday cards. Well the winners spoke and we got busy! The rest was up to us! We love the photos that Flynn posts of his outdoor adventures. We wanted that kind of style reflected in his card. We gave Flynn two versions. One with a paper background and one with a transparent background. Our next winner is Vicat. She's one of our special cat-loving Facebook friends. Glogirly says she has a sense of humor that's almost as dry as mine. Well I suppose that's better than wet. 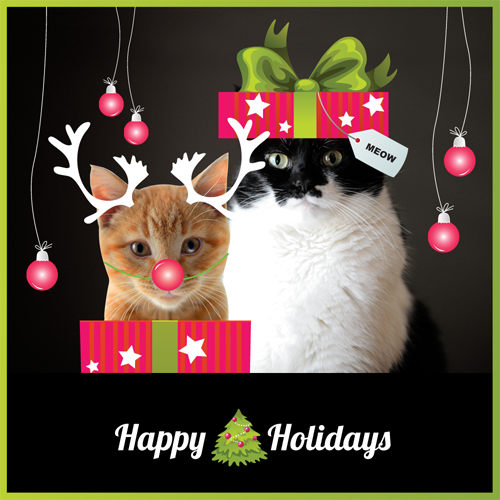 Vicat also chose a custom holiday greeting. And since she's a diehard GLOGIRLY fan, she wanted her card to feature yours truly. Oh, and the orange menace. I'll try not to hold that last part against her. And I'll try not to hold the fact that I'm wearing a box top on my head against Glogirly. But it was worth it. You should hear Waffles meow with that nose on him. Congratulations to Flynn & Vicat! And thank you so much to EVERYONE who entered. Please be on the lookout for a special line up of December giveaways coming your way soon. It's going to be a fun holiday season! If you don't want to miss a single giveaway, just sign up for our email updates. We send one out every time we publish a new blog post. And spam? Well that's just salty meat in a can to us. We won't share your email and we won't bother you either. Oh Concatulations to the winners! They both look super awesome! Katie you could start a fashion craze like Jackie Kennedy. But instead of a pillbox hat it would be a giftbox hat! We THOUGHT we heard a "Be-owww" out of him. I absolutely adore it! And Rags is convinced that Waffles is a distant cousin. Concatulations to both of them! We love both designs! We love Flynn and the second one is purrfect. I don't know why, but the card for Flynn make me cry. The one of Miss Katie with the box on her head is priceless. Concatulations to the winners! Those are awesome designs. BTW, I see Vicat at my Facebook page frequently too - and you are right, she is awesome! Concatulations to the winners! Those are way too pawsome! Happy Furday! congrats to the very lucky winners!!!! neaT! congrats to the winners! Congrats! Congrats! 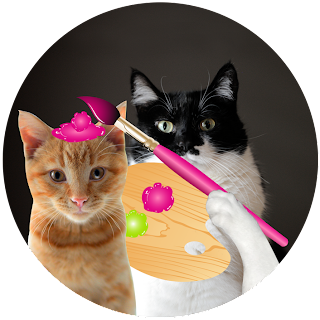 How paw-some! 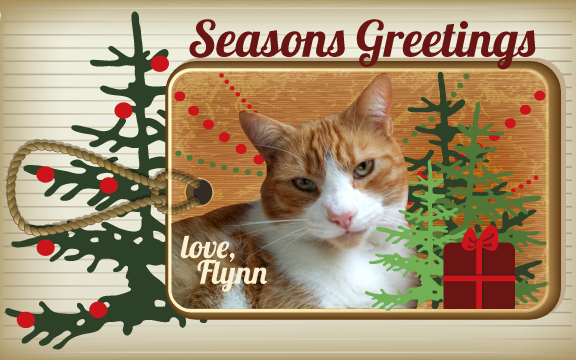 Flynn and Vicat got some pretty cool holiday greetings! 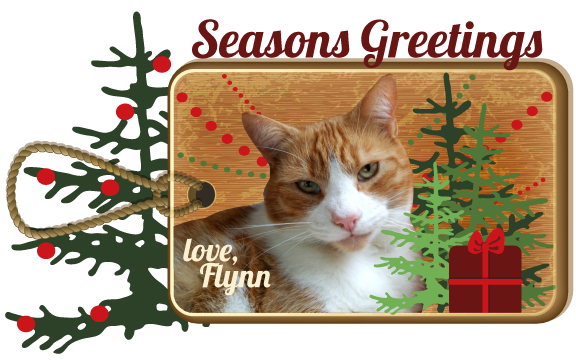 Flynn is looking very good and anyone would love to get greetings from Beautiful Katie and Waffles the Red Nosed Menace. Wowzers, does GloGirly do nice work! Those cards look great - what lucky winners! I love my cards you designed for me and I am going to email them to all my blogging friends next week. That is a lovely card for Vicat too. Those are beautiful. Lucky winners. Concats to the winners. They picked some cute designs. Very creative.